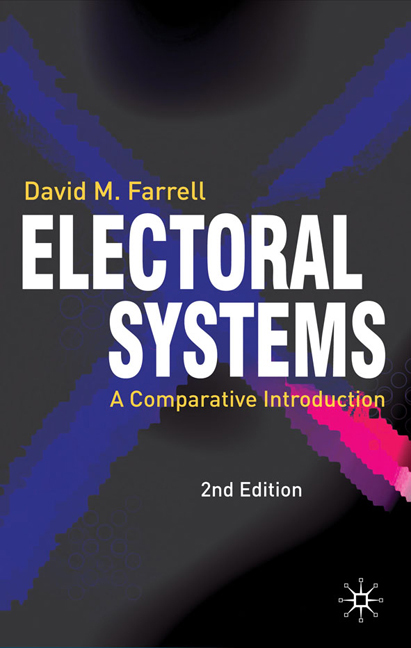 Electoral systems : a comparative introduction / David M. Farrell. Machine generated contents note: -- The Study of Electoral Systems -- The Single Member Plurality System and its Cousins -- Majority Electoral Systems : Two-Round Systems and the Alternative Vote -- The List Systems of Proportional Representation -- Mixed-Member Systems -- The Single Transferable Vote System of Proportional Representation -- The Consequences of Electoral Systems -- The Politics of Electoral System Design -- Electoral Systems and Electoral Institutions -- Electoral Systems and Stability. "Electoral Systems examines the six principle types of electoral system currently in use in more than seventy of the world's democracies. A common format is adopted throughout, dealing with explanations of how the system operates and its effects on the political system." Includes bibliographical references (p. 248-272) and index.